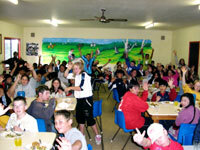 The staff at Boomerang Ranch have had many years experience in conducting school camps. Our aim is to provide all guests and all ages the experience of sharing many fun experiences in a relaxed family country atmosphere. Yabbying, hut building, hiking & more. To discuss a program CONTACT Theresa. Weekend and school holiday packages are available for children, adults and families.